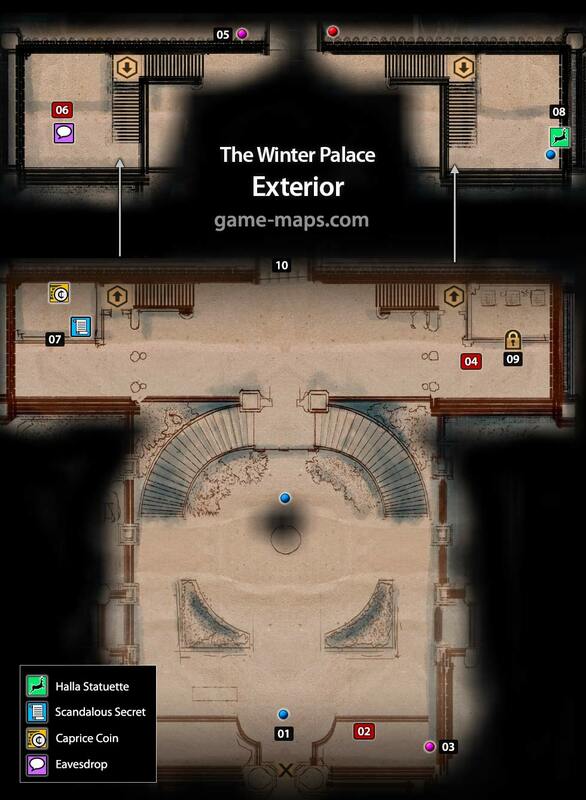 Halamshiral: The Winter Palace - Dragon Age: Inquisition Walkthrough, Game Guide and Maps, with Quest and Locations of Camps, Merchants, Rifts, Ocularums, Astrarium, Dungeon Entrences, Landmark (POIs), Crafting Station, Mosaic Piece, Inquisition Agent, Secrets, Party Members, Bottle of Thedas and Codex Entry. Sell everything you can to empty your inventory before enter this location. 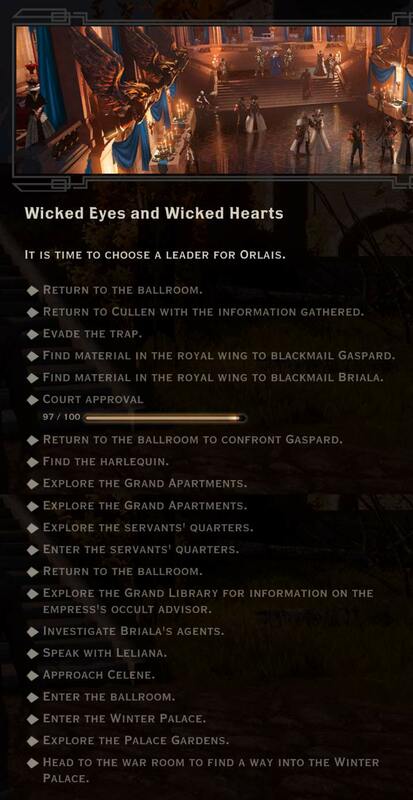 In this location you will decide who will be future ruler of Orlais: Empress Celene or Grand Duke Gaspard or Ambassador Briala. You have to earn Court Approval by collecting Scandalous Secrets, Caprice Coins and Halla Statuettes. IMPORTANT: In some regions of Winter Palace Court Approval will drop down in time. It is important not to drop Court Approval below zero. If it happens you will be evicted from Winter Palace. QUEST: The Great Blackmail Hunt Collect Scandalous Secrets. Use Storage Key to open. IMPORTANT: Some secretes and items are unavailable in first run. 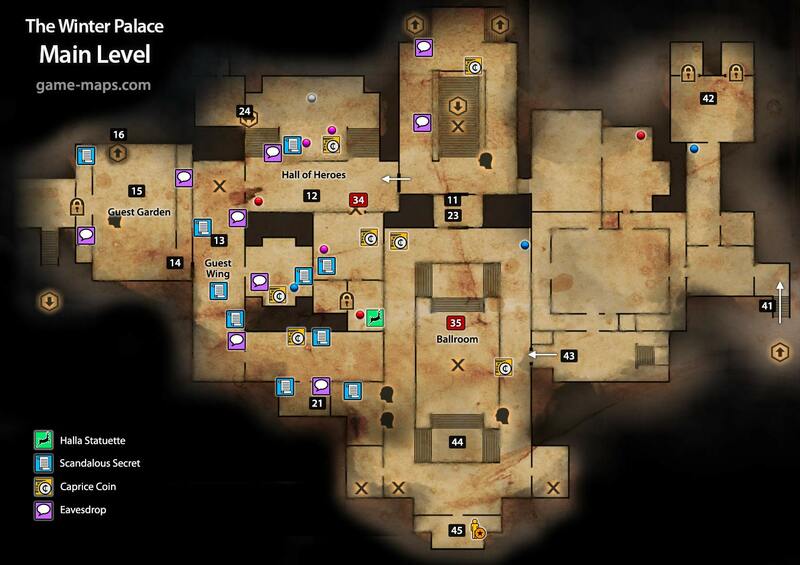 Search Winter Palace again after visiting Servant's Quarters. Enter Ballroom, watch cut scenes and exit to talk to Leilana. "In the bottom left corner of the guest garden you have 2 opportunities to obtain an agent by talking to two men that you eavesdrop on. You get an agent either by supporting mages or templars. It's a super easy agent to obtain! The only way you won't get him is if you don't talk to them." If you are off limits Court Approval will decrease slowly. Enter downstairs to secret room. You got Halla to open this Door. 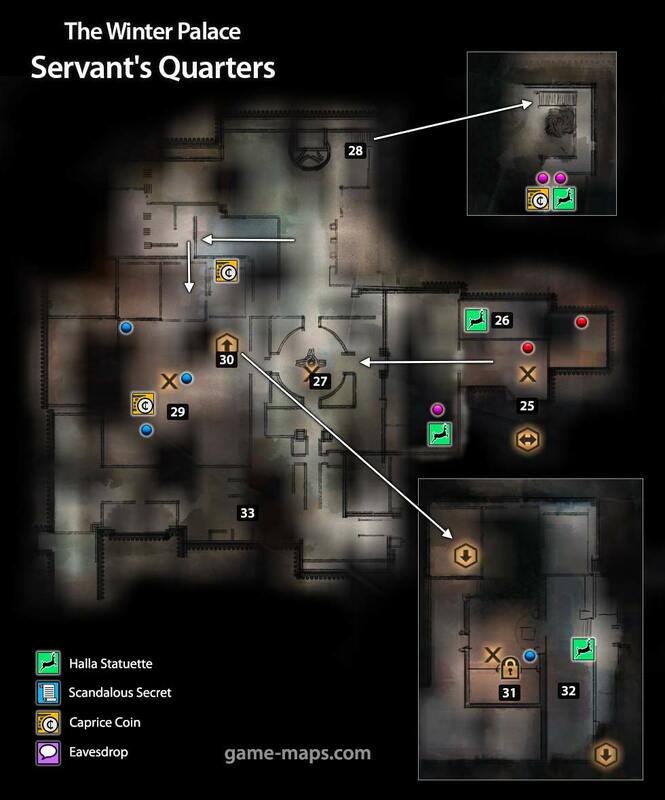 Equip Weapons and Armours for you and your team. Halla Statuette - look up, jump table, jump torch to pickup. 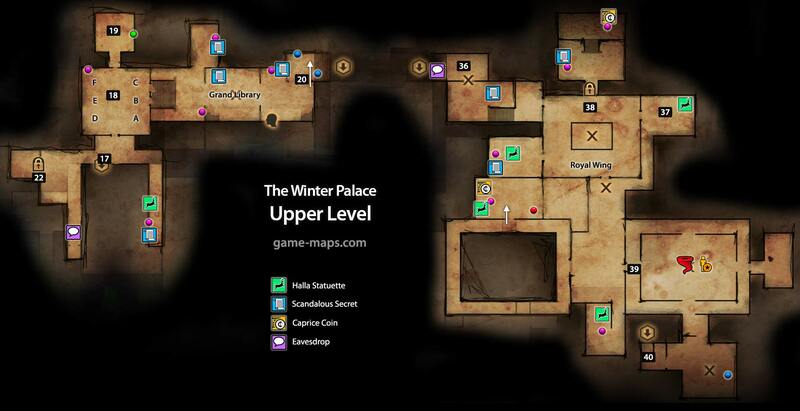 IMPORTANT: Some secrets in locations in Winter Palace visited before are now available. 2. Why don't you educate me ? 2. Is that what we both want ? 2. Which am I to you ? 6. Who do you trust ? Next, talk with your team. Don't make final decisions yet. Rescue spy and receive information. In this room you will get informations against Briala. Pickup 4 Hallas on this floor to open doors. Number of halla is limited, so you can not go into this room and save halla for (42). Talk to Florianne and defend. If you save halla at (38) you can open only one of this rooms. They are marked warrior and mage. There is nothing very special in those rooms just good loot. Its time for final decision. Select: "I'll talk with Florianne" to expose Duchess;'s Crimes to The Court and avoid future Bloodsheed. Next try to force Celene, Gaspard and Briala to cooperate. Select: "All of you are at fault." "At 44 when your approval is below a certain treshold (i believe it's 85) you aren't able to talk to Florianne and have to settle with the other two options(detain the Dutchess or wait for Florianne to Attack)." "... third option not show if u no enter the Empress's Private Quarters where Gaspard's agent is tied to the bed. Approval has nothing with it. Had 100 approval and had third option."